So, I stepped out of the shop door and found this varmint in the black currant tree about five feet from my face. I happened to have the Sony in hand and snapped a couple of shots just for you. No fear. At all. She's hungry, apparently. Well, that and she's used to me I guess. And she reminded me that I need to fill the squirrel feeders. Those black currants are nasty, bland and tasteless and frozen into little BB pellets. How she avoids becoming eagle food, I don't know - especially since I've seen three Bald Eagles this morning, two adults and a juvenile in speckled plumage. She's quick though and maybe that's it. She lives in the spruce tree down my back hill and can make it a hundred yards to the currant tree or the feeder without once setting foot on the ground. Amazing agility, wish I had it. So, there you go, Squirrel Bloggin Friday. We sometimes overlook that natural selection works both ways, my friend: she most likely comes of a fleet line of wily hiding squirrels, and you're liable to seeing the fastest and eagle-dodgiest of her children in years to come. Sorry. With my accuracy record on today's predictions, I just fed your squirrel to the birds. I probably shouldn't have written this at all. Too late. I would like to nominate Karl for winner of the thread. "I am not the meal you are looking for." "You are not the meal I am looking for." "I should be allowed to run up that tree." "She should be allowed to run up that tree." plus, I think she's related to the one that lives in the woods behind my apartment. Mine will sit very patiently, or drape artfully, across the large branch on the Japanese Cherry Tree outside my balcony. Even wait while I go get the camera and snap a few shots. Nasty little rodents, they are. You're obviously not cooking them correctly then, Janiece. That squirrel looks pretty fat. On a particularly gloomy Friday two years ago as I was about a half block from work I saw two crows attacking a squirrel. 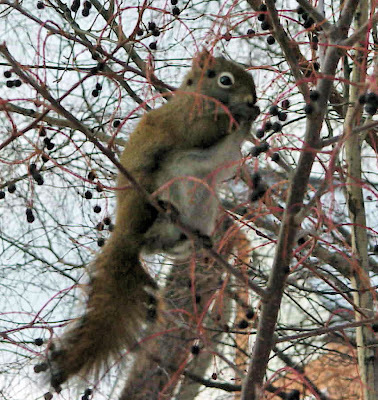 They kept diving at it and pecking at it and while the squirrel would contort its body to fend them off and run at the same time, it was being driven away from the safety of the trees and towards the street. As soon as the crows drove it into the street WHAM! a car in the opposite lane hit the squirrel. As soon as the car was gone the crows dove down to finish off the rodent. The crow-or raven?- smarter than an average rodent. Also, traffic aware. Obviously this is Ratatosk who carries messages up and down the Yggdrasil. An eagle would only eat this squirrel at it's own peril. Oh, and maybe Janiece should try stewing them. I mean she might be fricasseeing stewing squirrels. But that would explain it getting away from the eagles. If it could fry better. Now see, I gave Jim too much credit. When I first glanced at this photo, instead of suspecting that he has squirrel feeders (WTF, over?) on his property, I thought this was an awesome, awesome example of action photography, and that those black currants were actually buckshot from his Mossberg, meaning that he had captured the very last milliseconds of this squirrel's time on this mortal coil.